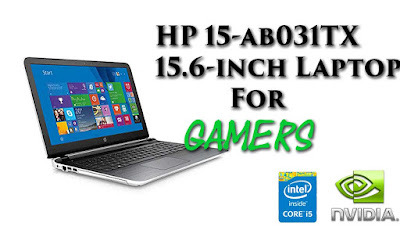 If you loves gaming and planning to buy a laptop in 2016, then check out HP 15-ab031TX a 15.6-inch Laptop by HP. This laptop had perfectly made for a mid segment gamer. With it's specifications and performance this HP laptop had ruled the hearts of the people. Though it has it's 5th gen i5-5200U processor, 4GB DDR3l RAM, and NVIDIA GeForce 940M 2GB DDR 3 graphics and old Windows 8.1 it's still in trend. You can read buyer's thoughts. Hp 15-ab031TX is packed with Fifth generation Intel i5-5200U which has a clocking speed of 2.2 GHz which can be increased upto 2.7GHz with intel Turbo Boost Technology. And for a gamer the laptop comes with a Dedicated graphic card by NVDIA. 2 Gigs of NVDIA GeForce 940M pushes the graphics up in 15-ab031TX by HP. This DDR 3 Memory had been backed by NVDIA Optimus Technology, NVDIA CUDA , Physics X and Direct X 11. And with a normal 1 TB SATA which gives read and write 150MB/sec @5400 RPM you can save a lot of games and videos in this laptop. Also it have HP ProtectSmart HDD protection which protects your hard drive from any minor shocks or impacts. But as HP 15-ab031TX 15.6-inch Laptop was released in mid 2015 so it comes with windows 8.1 which is Old in 2016 and also if you have decided to go for this laptop then remember you will be charged for an upgrade to windows 10 as 1 Year free upgrade by windows 10 had ended last month. So now you need to buy Windows 10 if you are so desperate to get it. HP 15-ab031TX have got some fine looks and design. It is available in Blizzard White Color horizontal brushing and perfectly matches the style. It weight around 2.29Kgs and the dimentions are (HxWxD) 0.99 x 15.14 x 10.28 inches. This laptop have Full HD Anti-Glare LED display 15.6" which have resolution of 1920*1080 FHD and 16:9 True wide aspect ratio. This bright display is accompanied by HP dual Speakers which comes with Bang & Olufsen Equalizer software which will give you a rich authentic audio experience. In network and connectivity HP 15-ab031TX have got Wired lan options (10/100) with a RJ 45 slot, integrated wireless lan 802.11b/g/n and with a bluetooth 4.0 for PAN. It have got two USB 3.0 and one USB 2.0 port and a HDMI v1.4 for connection to a television. 15-ab031TX had HP TrueVision HD Webcam which can record HD videos by 30 Frames per second. With dual array Digital microphones, your Skype experience will be more enhanced. And you will get a true typing experience with it's Island-style keyboard which comes with a numeric keyboard. And with it's HP image pad which supports Multi-Touch Gesture, will maximize the functionality of the touch pad. Now let's talk about the battery. It have a 4 Cell Lithium ion battery and HP claims that it can give 4Hrs uptime. But customer reviews are nice on this department. As some of the people have claimed that it can easily give up to 4.5 hrs. You can get HP laptop from Amazon. As with these awesome features of HP 15-ab031TX 15.6-inch Laptop and nice user experience you will get value for money. And as HP 15-ab031TX is a gaming laptop so there will be no performance issue with this awesome piece of hardware. If you have any questions regarding HP Laptop you can let me know in comments and also if you have this Laptop, you can share your experience with HP 15-ab031TX.